To run Gremlin in a Docker container, view the guide on How to Install and Use Gremlin in a Docker Container. docker build -t htop . Next we will create an nginx container and monitor the new container directly by joining the nginx container’s pid namespace. htop can be used to monitor Gremlin attacks against the host and Gremlin attacks against individual containers. Next we are going to install Gremlin on the host to perform attacks. Click Exact and select the host you created the nginx Docker container on, in this example that is 138.68.226.195. Container labels will enable you to choose containers on your host to attack. Click to enable container labels, type in the label details of the container. For this example, the Nginx Docker container label we created is set to service=nginx. Finally select ”Create” to kick off a random Gremlin CPU Resource Attack on the nginx Docker container. 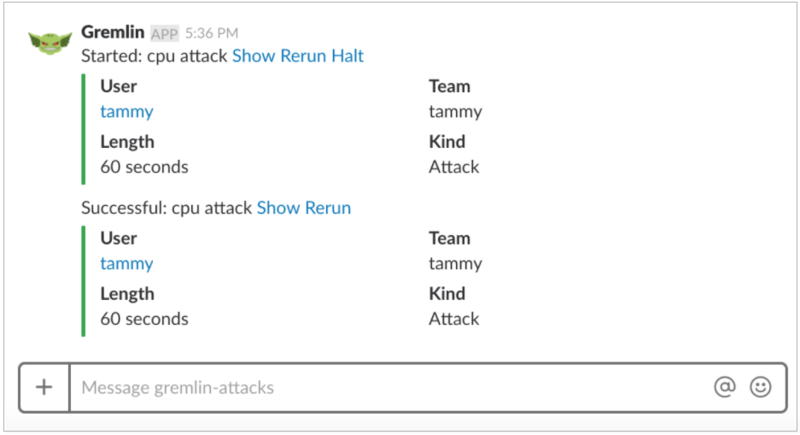 If you have the Gremlin Slackbot enabled you will also see the bot post that the Gremlin Attack has started. When it’s successful the Gremlin Slackbot will post again. To setup the Gremlin Slackbot follow the guide, How to Setup and Use the Gremlin Slackbot. When your attack is finished it will move to Completed Attacks in the Gremlin App. To view the logs of the Attack, click on the Attack in Completed Attacks. You've installed Gremlin on a server running Docker and validated that Gremlin works by running the “Hello World” of Chaos Engineering for Docker Containers, the CPU Resource attack. You now possess tools that make it possible for you to explore additional Gremlin Attacks. Gremlin’s Developer Guide is a great resource and reference for using Gremlin to do Chaos Engineering. You can also explore the Gremlin Community for more information on how to use Chaos Engineering with your infrastructure.